This week marks a somber milestone in Internet history: the 5-year anniversary of former Egyptian President Hosni Mubarak’s order to shutdown his country’s access to the global Internet amid widespread protests. Similar popular protests would sweep through the region during a time frame that became known as the Arab Spring. Within days of the Egyptian blackout, Internet service would be restored and Mubarak would resign after 30 years in power. As the Arab Spring protests spread to other countries, the trend of government-directed Internet blackouts continued in Syria, Libya, and Bahrain. In the years since 2011, we have documented (on this blog and on our Twitter feed) government-directed blackouts in a number of countries, including Sudan, Iraq, and most recently Congo-Brazzaville. While the protests in Tahrir Square came to exemplify the greater Arab Spring movement, the legacy of the Egyptian Internet blackout was that it ushered in the modern era of government-directed suppression of Internet communication. On the evening of 27 January 2011 (US Eastern Time), we were alerted to the Egyptian blackout by our BGP route monitoring system. Within minutes, I was assisting my colleague Jim Cowie in publishing a detailed analysis of the event. (We were Renesys back then.) The prior day, we had received a tip from an Egyptian telecom engineer that the government was warning some telecoms that they should be prepared to act quickly if the government ordered the shutdown of Internet services. Just after midnight local time in Egypt, that order came and nearly all Egyptian access to the global Internet was down in a matter of minutes. At the outset, we noticed that one Egyptian ISP, Noor, remained connected to the global Internet despite the disappearance of all other providers. On 31 January 2011, we published a blog post noting that Noor was still online and speculating as to why this particular ISP was spared. However, hours after publication, Noor went offline as well. It seems that Noor had been overlooked by the Egyptian government as its international links did not go through the Ramses Exchange, where the blackout had been primarily orchestrated. We also learned a lesson about drawing potentially unwanted attention to surviving communications links, especially during government-mandated shutdowns. In the weeks that followed, we worked with several news publications to help tell the story of the Egyptian shutdown as seen in our data. The following popup image accompanied a piece from the New York Times and was derived from the line plot at the top of this post. In addition to losing access to the global Internet, domestic Internet communications were also disrupted. At the time, Telecom Egypt did not peer domestically with its local competitors, presumably in an effort to protect its dominance in the Egyptian market — a common practice of national incumbents. (See Mexico’s Telmex or Turkey’s TurkTelekom (on slide 35) as other examples.) The result was that other Egyptian ISPs like Etisalat Misr had to send traffic through Internet exchanges in Western Europe to reach Telecom Egypt. That is, domestic Egyptian connectivity was entirely dependent on international links to Europe. So not only could the Egyptians not communicate with the rest of the world, they could not effectively communicate with each other. Egyptian President Hosni Mubarak stepped down on 11 February 2011 and, three days later, protestors in Bahrain declared February 14th to be a “Day of Rage” and called for national protests. As the protests erupted around Pearl Square, the Internet began to slow to a crawl. During this time, Bahraini incumbent Batelco lost service from one of its two international carriers, namely, India’s Reliance. Batelco later explained that a “service degradation” had occurred without elaborating on the cause. The following graphic shows our measurements to Batelco around this time and the impact of the loss of Reliance transit (purple). The upper graph shows the median latencies (observed by our servers around the world) doubling from around 250ms to 500ms as Bahrain’s international capacity plummeted after losing Reliance transit. After Bahrain, Libya was the next country to take down its Internet in response to widespread protests against the government of Muammar Qaddafi. Initially, the 14 BGP routes defining the Libyan Internet were withdrawn on February 18th, disconnecting Libya from the global Internet. (By way of comparison, neighboring Egypt’s Internet consisted of around 3,100 BGP routes at the time.) The routes were restored the following day and generally stayed up throughout this tumultuous period. However, despite this apparent connectivity, on March 2nd Internet communication into and out of Libya ceased. 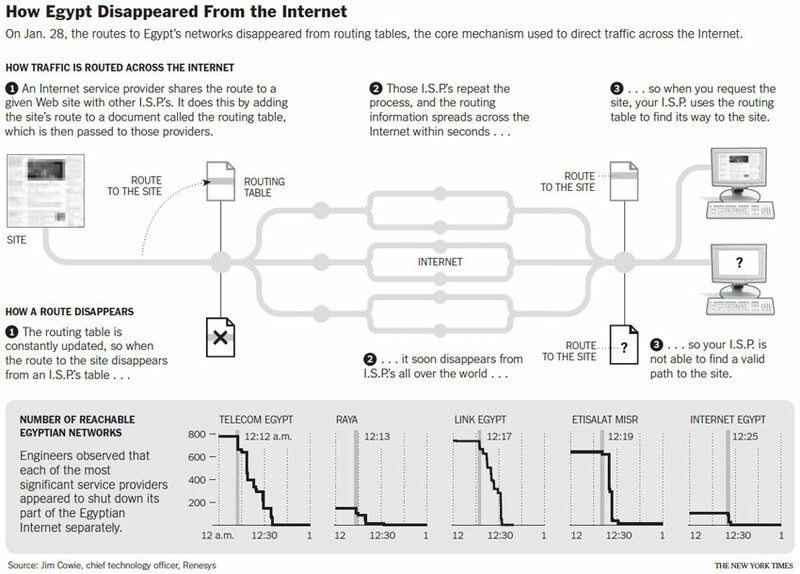 The lesson that Libya seemed to take away from the Egyptian shutdown was to block most Internet communications, but to leave the actual connections up for limited approved use only. Libyan state telecom LTT blocked most Internet traffic for almost six months until service was finally restored on 21 August 2011, after the fall of Qaddafi. For the definitive analysis on the Internet’s role in the Libyan uprising, see this excellent discussion by researcher John Scott-Railton, now with University of Toronto’s Citizen Lab. Congratulations, Libya, on emancipation from the rule of the tyrant. Despite the turmoil in Libya in recent years, we have observed modest growth of the Libyan Internet since the toppling of Qaddafi. The 14 routed networks making up Libya’s Internet in 2011 has grown to 66 networks and the Libyan incumbent LTT now has several independent competitors, including Trans-Sahara (AS327736) and Aljeel Aljadeed For Technology (AS37284). Syria’s first government-directed outage occurred on 3 June 2011 and we detailed it here. What remains notable about this incident was that, as in Libya, this outage was selective, but much less broad and targeted at specific classes of users — routes supporting residential ADSL and mobile service went down, but government institutions such as the Syrian Oil Ministry stayed online. This selectivity showed that the Assad government had the ability and willingness to orchestrate a blackout targeted at the communication services of the people of Syria. However, curiously none of the subsequent major outages in Syria (such as in November 2012) displayed this selectivity. This change in behavior might support the Syrian government’s claims that those subsequent outages were the result of fiber optic cable cuts. Recalling the lesson of the Noor Group in Egypt, we were mindful not to discuss the presence of any potentially independent Internet connections out of Syria. For example, the Ministry of Higher Education (195.60.236.0/22 announced by AS39154) wasn’t transited by the Syrian state telecom (AS29386), but was connected to the outside world over satellite through the European academic network DANTE (AS21320), a fact we deliberately omitted from our posts on Syria at that time. Unfortunately, AS39154 and its single routed prefix disappeared on 4 August 2011 and has never reappeared. In 2012, Jim Cowie posed the question Could it happen in your country?, which highlighted countries with few independent Internet connections to the outside world and hence, susceptible to an Egypt-style Internet blackout. Dozens of countries, including several of the ones highlighted here, were found to be at severe risk of disconnection. With five years of hindsight, we can see that the Egyptian Internet shutdown was not an anomaly, but rather a harbinger of things to come, namely, an era where Internet communications would be directly threatened by repressive governments in an effort to control their own people. We will continue to document these events as they occur on this blog and via Twitter. Doug Madory is a Director of Internet Analysis at Oracle Dyn where he works on Internet infrastructure analysis projects. Doug has a special interest in mapping the logical Internet to the physical lines that connect it together, with a focus on submarine cables.